British Registered Car Insurance in Spain for Cars, motorhomes, caravans, quads, 4x4s for anything on wheels that needs insurance in Spain. British car insurance in Spain. www.insuranceinspain.com are expatriates and we understand the need for protection when you are not living in the UK. If you have chosen to live in this wonderful country of Spain, you want the peace of mind to know that what you have is protected. 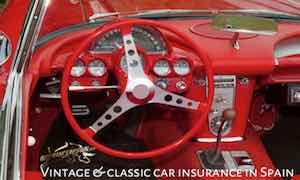 British and foreign registered cars can be insured through us. British registered cars in Spain are a common sight. All motor vehicles and trailers must be insured when entering Spain. It isn’t mandatory for cars insured in most European countries to have an international insurance ‘green’ card and motorists insured in an EU country, Liechtenstein, Norway and Switzerland are automatically covered for third-party liability in Spain. There are an estimated 2 million drivers without insurance in Spain, where there’s also more insurance fraud than in any other E.U. country. Note, however, that driving without obligatory insurance (seguro obligatorio) is a serious offence, for which you can be fined up to 3,000€ or even imprisoned. It is recommended to have your insurance documents (or legal copies) with you while being on the road. As some insurers don't issue new documentation every year you should also carry proof of the most recent insurance payment. Asistencia en viajes, glass breakage (rotura de lunas) and legal expenses (defensa penal) in the event of a court case is usually included in most policies or can be added for an additional premium. Responsabilidad civil obligatoraia is the basic cover required. If you have an accident that is your fault your insurance will cover the damage to the other vehicle only. It will also include windscreen/glass cover, legal expenses and breakdown cover. Responsabilidad civil obligatoria, incendio y robo, known in some countries as ‘part comprehensive’, includes cover against fire (incendio), natural hazards (e.g. rocks falling on your car), theft (robo),broken glass (e.g. windscreen), legal expenses (defensa penal), and possibly damage or theft of contents (although this is rare). Insurance against the theft of a stereo system is usually available. Sometimes called ‘fully comprehensive’ insurance, known in Spain as ‘all risks’ (todo riesgo). It covers all the risks listed under third-party, fire and theft (above) plus all other types of damage to your vehicle irrespective of how it is caused. Note that some insurance companies do not provide comprehensive cover for vehicles more than two or three years old (although it’s possible to get comprehensive cover on vehicles up to ten years old). Comprehensive insurance may be compulsory for lease and credit purchase contracts. Note that Spanish insurance does not usually pay for a replacement car when your car is being repaired after an accident. You can contract a hire car in the event of an accident for an additional premium. Driver and passenger insurance (seguro de ocupantes) is usually optional and can be added to insurance policies. Driver protection allows the driver of a vehicle involved in an accident to claim for bodily injury for himself, including compensation for his incapacity to work or for his beneficiaries should he be killed. There are usually various optional levels of driver and passenger accident insurance, e.g. from 3,000€ to 30,000€ for death and permanent disability. Special insurance can be purchased for car accessories and extra equipment fitted to your vehicle such as an expensive car stereo systems. The type of insurance required. The type of car and its use. Cars are divided into eight categories, based on their performance (some companies don’t insure high-performance vehicles), the cost of repairs, where and how much they are used (some premiums are based on the number of kilometres driven each year) and whether they’re used for business or pleasure. Your age and accident record. Drivers with less experience usually pay more, likewise drivers under a certain age, e.g. 25, also pay a higher premiums. Some insurance companies refuse to insure drivers under 25. Other companies give discounts for experienced drivers of any age. The area where you live. Premiums are highest in Madrid and other major cities and lowest in rural areas. Whether the car is garaged. Some insurance companies give an additional discount if a vehicle is garaged overnight. Value added tax (VAT/ IVA) at 21% is payable on insurance premiums. You can reduce your premium by choosing to pay an excess (franquicia). If you’re convicted of drunk or dangerous driving, your premium will be increased considerably. In fact, if you’re convicted of drunk driving, your insurance company will probably refuse to pay out on a claim! Insurance companies must give two months’ notice of an increase in premium. Therefore it is important to know that if you are planning to change your insurance company, you must notify them two months in advance to ensure that you are not automatically charged for the renewal. A foreign no-claims bonus (bonificación) is usually valid provided you have had insurance within the last two years, but you must provide written evidence from your present or previous insurance company, not just an insurance renewal notice. You may need an official Spanish translation. Always insist on having your no-claims bonus recognised, even if you don’t receive the same percentage reduction as you received abroad. Most companies offer a discount for each year of no claims up to a maximum discount of 60 percent, although some offer a maximum of only 50 percent depending on the company and your driving record. If you have an accident you’re usually required to pay an excess depending on the terms and conditions of your policy. Your no claims bonus maybe reduced depending on who caused the accident, e.g. one accident may lose you two years’ no-claims bonus. However, some policies, like ours can offer protection of your no-claims bonus. In the event of an accident, claims are decided on the information provided in the accident report forms (declaración de amistosa de accidente), which should be completed by both drivers, reports by insurance company experts and police reports. You must notify your insurance company of a claim within a limited period, e.g. two to five days. Many companies have a 24-hour help lines for claims in Spain and abroad. If you have an accident the damage is usually inspected at a garage of your choice and the repair authorised by your insurance company’s independent assessor. An inspection may be unnecessary for minor repairs but the insurance company will still need to be notified. If your car is stolen, you must report it to the police immediately and submit a copy of the police report with your claim. After reporting your car stolen the insurance company will deal with the police in an effort to recover your vehicle. After 40 days the insurance company will then consider it for payment as a claim. There’s little communication or co-operation between insurance companies in Spain and trying to recover uninsured losses is a nightmare. So when you use www.insuranceinspain.com we process all of this for you. Spanish insurance companies are forbidden by law to cancel third-party cover after a claim, except in the case of drunk driving or when a driver is subsequently disqualified from driving. A company can however, refuse to renew your policy at the end of the current period, although they must give you 15 days’ notice. Note also that if you have an accident while breaking the law e.g. drunk driving or illegal parking, comprehensive insurance may be automatically downgraded to third-party, which means that you must pay for your own repairs. If you wish to cancel your car insurance at the end of the current term, you must notify your insurance company in writing by registered letter and usually give two months’ notice. You may cancel your insurance before the term has expired if the premium is increased, the terms are altered or your car has been declared a write-off or stolen. If you cancel your policy during the term of the insurance, e.g. you sell your car and don’t take out another policy, your insurance company isn’t required to give you a refund. If you’re going to be driving in Spain it’s important to have motor breakdown insurance (seguro de asistencia en carretera), which may also include holiday and travel insurance, including repatriation for your family and your car in the event of an accident or breakdown. Insurance companies usually offer as standard, accident and breakdown service (asistencia en viaje), which is adopted by some 75 percent of Spanish motorists. The breakdown service normally covers the policyholder and anyone else in the vehicle at the time of the problem. The 24-hour telephone number of the breakdown service’s head office is shown on a card or your policy which should be kept in your vehicle. If you have an accident or break down you simply call the emergency number and give your location, a recovery vehicle is sent to your aid. Your British registered vehicle must have a valid MOT certificate at all times whilst driving in Spain. Driving without a valid MOT certificate will Null and Void any claim you may make regardless of whether it was your fault or the fault of another driver. If you are in any doubt please contact us and we will do all we can to answer any questions regarding insuring your British registered car in Spain. Just call 0034 965 27 57 27, chat to us online or ask us to Call you back using the facilities on our contact page. Thank you. Please drive safely. Get a quote for UK Plated Vehicle Ins.